Welcome to the home of the Alpine Environmental Data Analysis Center! Please register to get a user account. Once this is done you will be granted access to the AlpEnDAC. Climate change impacts the system Earth. Especially, the Alpine region is known to be very sensitive. Alpine high altitude research stations contribute significantly to monitoring, understanding and forecasting of processes in the Earth system. Their exposed location creates almost ideal conditions for the investigation of many physical and chemical processes in the atmosphere, geosphere, cryo - and hydrosphere and the biosphere. 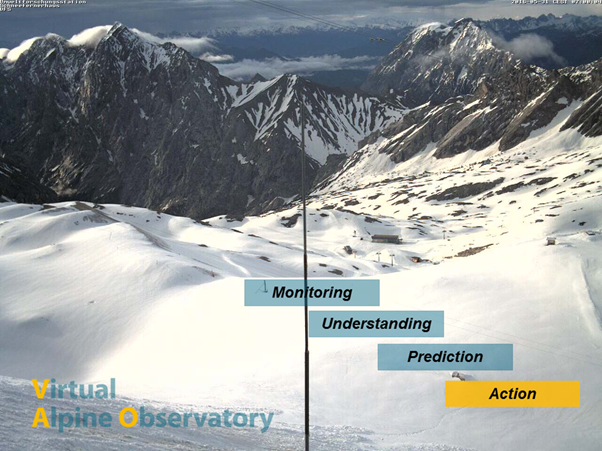 The Virtual Alpine Observatory project (VAO) supports the research activities of the Alpine high altitude research stations by combining their measurements and performing joint research projects. Access to other data, e.g. satellite - based, and to high performance computing facilities create almost unique research opportunities.